I Don't Hear the Fat Lady Singing Yet. Yo, homies. These are dark days. Not even my VFC M4CR AEG with Silver MadBull Noveske CQB Outer Barrel can cheer me up right now. The more I think about the ramifications of this dreadful California Senate Bill (SB) 798 seemingly slapped together by CA Senator Kevin De Leon, the more my mental state becomes a 6mm Soup Sandwich. Alliteration FTW. But we have not lost the battle yet. To be Frank (instead of Tom), I can't say I've been able to scour the entire "interwebz" to look at every single mention of Senator De Leon's dirty work, but from what I have looked at, I haven't seen anybody cover the actual process that we're dealing with and at which stage of that process we have currently reached with the passing of SB 798 on the floor of the Senate Committee on Public Safety as of 05/09/11. So I thought I'd hop on over to www.leginfo.ca.gov, copy their wording on the California Legislative Process, and paste it here for the three of you that read my blog to see where we're at. I don't know about you, but I horsed around during the majority of my AP Government class in high school and I flat-out did not show up for most of my college-level govt courses because I was too busy studying the art of leisure on my parents' hard-earned dime. So this wasn't even a refresher for me. It was a straight up introduction to how a bill becomes law. And yes, I know there are those animated videos with Barry White's dad singing a song about it, but I don't have the time nor the inclination to deal with that junk. The process of government by which bills are considered and laws enacted is commonly referred to as the Legislative Process. The California State Legislature is made up of two houses: the Senate and the Assembly. There are 40 Senators and 80 Assembly Members representing the people of the State of California. The Legislature has a legislative calendar containing important dates of activities during its two-year session. All legislation begins as an idea or concept. Ideas and concepts can come from a variety of sources. The process begins when a Senator or Assembly Member decides to author a bill. - I won't mention his name here, but let's just say he's on the NRA's "Naughty List." A Legislator sends the idea for the bill to the Legislative Counsel where it is drafted into the actual bill. The draft of the bill is returned to the Legislator for introduction. If the author is a Senator, the bill is introduced in the Senate. If the author is an Assembly Member, the bill is introduced in the Assembly. A bill is introduced or read the first time when the bill number, the name of the author, and the descriptive title of the bill is read on the floor of the house. The bill is then sent to the Office of State Printing. No bill may be acted upon until 30 days has passed from the date of its introduction. The bill then goes to the Rules Committee of the house of origin where it is assigned to the appropriate policy committee for its first hearing. Bills are assigned to policy committees according to subject area of the bill. For example, a Senate bill dealing with health care facilities would first be assigned to the Senate Health and Human Services Committee for policy review. Bills that require the expenditure of funds must also be heard in the fiscal committees: Senate Appropriations or Assembly Appropriations. Each house has a number of policy committees and a fiscal committee. Each committee is made up of a specified number of Senators or Assembly Members. During the committee hearing the author presents the bill to the committee and testimony can be heard in support of or opposition to the bill. The committee then votes by passing the bill, passing the bill as amended, or defeating the bill. Bills can be amended several times. Letters of support or OPPOSITION are important and should be mailed to the author and committee members before the bill is scheduled to be heard in committee. It takes a majority vote of the full committee membership for a bill to be passed by the committee. Each house maintains a schedule of legislative committee hearings. Prior to a bill's hearing, a bill analysis is prepared that explains current law, what the bill is intended to do, and some background information. (This is where Senator De Leon used Wikipedia & no other source to substantiate his "expertise" in this area). Typically the analysis also lists organizations that support or oppose the bill. - These readings just occurred a few days ago, each time resulting in a 5 to 2 vote in favor of passing this bill. Bills passed by committees are read a second time on the floor in the house of origin and then assigned to third reading. Bill analyses are also prepared prior to third reading. When a bill is read the third time it is explained by the author, discussed by the Members and voted on by a roll call vote. Bills that require an appropriation or that take effect immediately, generally require 27 votes in the Senate and 54 votes in the Assembly to be passed. Other bills generally require 21 votes in the Senate and 41 votes in the Assembly. If a bill is defeated, the Member may seek reconsideration and another vote. Once the bill has been approved by the house of origin it proceeds to the other house where the procedure is repeated. - Please correct me if I'm wrong, but as of today (05/12/11), I believe we are at this stage, unfortunately. This bill should not have gotten this far, but like a simpleton, I put too much faith in humanity. Lesson learned. However, while I still know fairly little about this process, after some additional research, I'm starting to feel like I know enough to be dangerous. Dangerous like Maverick in his F-14 Tomcat Fighter Jet. If a bill is amended in the second house, it must go back to the house of origin for concurrence, which is agreement on the amendments. If agreement cannot be reached, the bill is referred to a two house conference committee to resolve differences. Three members of the committee are from the Senate and three are from the Assembly. If a compromise is reached, the bill is returned to both houses for a vote. - Even though he's a Democrat, which doesn't automatically prove, but certainly increases the chances that he doesn't like guns, we ALL need to write California Governor, Jerry Brown letters, flooding his office with our voices of POLITE, but strong opposition. It's essential that we provide concrete examples (which aren't hard to find) of why this bill not only creates an increased risk for law enforcement and the general public, but also will almost certainly cost our economically challenged state millions in lost tax revenue. 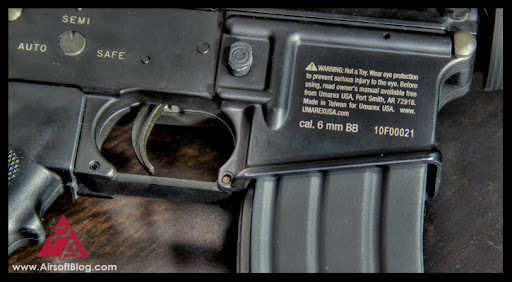 VFC M4CR Airsoft AEG lower receiver with a safety warning that this is "not a toy" (because it isn't). While I'm no attorney, I AM a descendant of at least five, possibly six generations of attorneys that I'm aware of, so that's pretty much as good as gold in my book. You can't argue with DNA. Therefore, it's my understanding is that if the law says it's a toy, then it has to comply with certain aesthetic criteria. My thought is that we need to attack the notion that Airsoft guns are "toys" as our primary objective. If we can convince either the California State Assembly house majority and/or Governor Brown that they're anything BUT a toy, it would seem logical that one of them would stop this bill in its tracks and the existing laws would remain in effect, leaving the status quo unchanged (for the time being). Airsoft guns would, therefore, NOT be required to be painted bright colors or made of transparent material like a "toy" gun is required to be, avoiding the deceptive appearance of being lame. Airsoft, as a whole, would be saved and I'm guessing world peace would soon follow, but I can't be 100% certain on that. Just a guess. If both houses approve a bill, it then goes to the Governor. The Governor has three choices. The Governor can sign the bill into law, allow it to become law without his or her signature, or veto it. A governor's veto can be overridden by a two thirds vote in both houses. Most bills go into effect on the first day of January of the next year. Urgency measures take effect immediately after they are signed or allowed to become law without signature. 8. 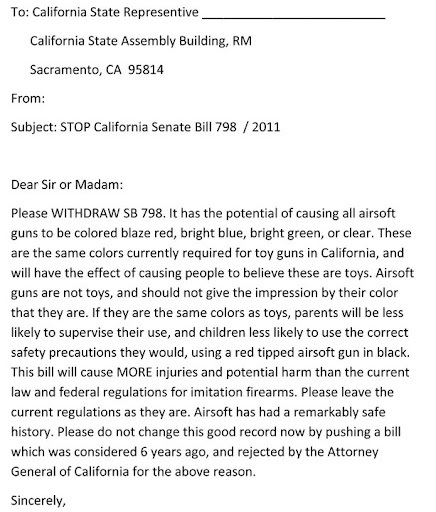 California Law, aka the Death of Airsoft as we know it. Bills that are passed by the Legislature and approved by the Governor are assigned a chapter number by the Secretary of State. These Chaptered Bills (also referred to as Statutes of the year they were enacted) then become part of the California Codes. The California Codes are a comprehensive collection of laws grouped by subject matter. The California Constitution sets forth the fundamental laws by which the State of California is governed. All amendments to the Constitution come about as a result of constitutional amendments presented to the people for their approval. And there you have it: hot knowledge dropped. not just call in their offices. Calling certainly helps, but if you had to choose one or the other, you should send the letter. It's easier for the Senate offices to track and verify legitimate responses to the bill if you write in, or something like that. This is just what I've been told by my sources who are working on this issue much more closely than I, but it makes enough sense to me. You'll notice that I blew the crap out of one particular sentence regarding letters of opposition being important. Those were the words written by the author(s) of www.leginfo.ca.gov, whom I'd like to think know EXACTLY what the crap they're talking about. So "anonymous Leginfo writer" says we should write letters, huh? Well then we need to write some freakin' letters! Since I can't claim to be doing any real ground-breaking work here, I'll admit there are numerous groups of people who have already got the ball rolling to fight this mess. There is even a pre-drafted letter that you can use as your template to write in to your Senator's office. This would be an excellent option for those of you without the ability or confidence to formulate a proper sentence. In all likelihood, I'm probably a good candidate for this template myself. However, I like to live on the edge, so I'm in the process of drafting my own letter. I'll post here for all the world to see when I'm done. I should not have to say this next part, but you KNOW there's always someone who needs to hear it. If you do decide to use the letter to the left, make sure you just don't print it out and send it in as is. You need to fill in the name of the specific Assemblyman/woman you're addressing. You'll also want to sign your name at the bottom and probably including your zip code for good measure. If you're looking for addresses of any and all Assembly members, I have reason to believe the "Assembly Member Roster" is what you seek, as listed on the CA State Assembly website. Here is the link: California Assembly Member Roster. You'll need each member's mailing address, which you can get by clicking on their names. The link takes you to their individual website and based on the sample I took of the entire population (that's an auditor's phrase), each member's website should have the mailing address of their respective office on the home page. There's also a CA SB 798 Petition circulating all over Facebook, thanks to the "spammingly" awesome efforts of Brian Holt, of Echo1 fame. Feel free to sign that in case that becomes an influential tool in our battle. 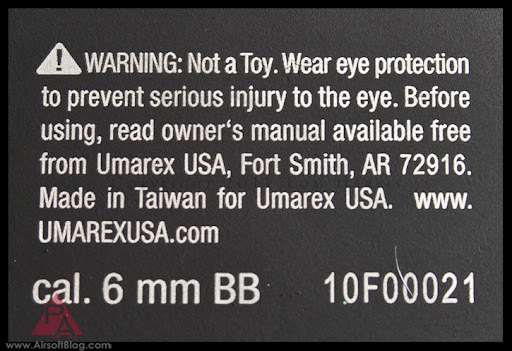 What kind of toy requires you to wear eye protection to avoid serious injury (you know, like BLINDNESS?!?!? ), yet is somehow meant for children to play with, per Webster's definition of a "toy"?